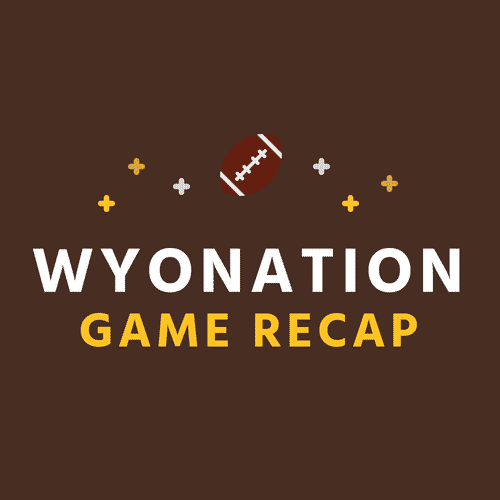 The Wyoming Cowboys weren’t going to let their season end on Saturday, and were going to make sure they gave the seniors another opportunity to finish their careers in the post season. Wyoming took a road trip to New Mexico and absolutely punished the Lobos 31-3 on Saturday. New Mexico was outgunned from the outset. Wyoming took the opening drive to the end zone on the backs of Nico Evans and Xazavian Valladay. Evans was not expected to play on Saturday, however, he suited up and put 142 yards rushing on the Lobos. Valladay finished with a career high 192 yards. Tyler Vander Waal also got the start for the Cowboys, replacing the injured Sean Chambers. Chambers suffered an injury last weekend against Air Force and had surgery on Wednesday. Vander Waal finished Saturday 4/17 for 41 yards, and rushed for 16 yards on the day. Vander Waal struggled all day with getting passes to receivers, however, with the rushing attack gaining 366 yards his arm wasn’t needed to win the game. Wyoming finished the season on a four game winning streak to get themselves bowl eligible. The Cowboys were 2-6 and it looked like their season might be over. However, the Cowboys didn’t give up on their season and got wins against Colorado State, Air Force, New Mexico, and San Jose State to cap their 6-6 season. They are bowl eligible for the third straight year. The program has never gone to three straight bowl games. Wyoming will need help getting into a bowl game, however. The Mountain West lost ties to one bowl game in the past offseason, and there looks to be a glut of teams who will be bowl eligible. An argument could be made that the Pokes will come in on a winning streak. Pokes fans generally travel fairly well for bowl games as well. Wyoming will learn its fate later on in the next week or two of where they’ll be headed. The Cowboys opened up the scoring with Xazavian Valladay taking a 21 yard run to the house on the opening drive. The teams would trade punts heading into the second quarter in a back and forth field position game. Nico Evans would get his name on the score book by taking a 30 yard run to the end zone to give Wyoming its second score. New Mexico would get on the board with a muffed punt snap from Dontae Crow and would recover deep in Wyoming territory. However, the Cowboy defense would step up and hold the Lobos to a field goal. As the second half got under way the Cowboys opened it up on the Lobos. Cooper Rothe had the only score of the third quarter with a 37 yard field goal. Rothe has only missed one field goal on the season, a knuckleball into a stiff wind in Laramie. He is a finalist for the Lou Groza Award. Austin Conway used his speed on a perfect option pitch from Ayden Eberhardt and took a rush 11 yards for a score. Wyoming would tack on another score on their following drive on a 20 yard Valladay run. With a 31-3 lead Wyoming began substituting offensive starters to finish the game. The Cowboys amassed 366 yards on the ground. The Lobos finished with 83 total offensive yards. The Cowboy defense absolutely suffocated the Lobos all day. The Pokes held the ball for ten more minutes than the Lobos, which showed as the Lobo defense just wore down. Wyoming finished the day with four sacks, from Logan Wilson, Carl Granderson, Andrew Wingard, and Kevin Prosser. Tyler Hall caused the lone Cowboy turnover. Wilson led all tacklers with six. Wingard moved into a first place tie for all-time tackles in the Mountain West conference with 454. Wyoming will wait and see their bowl fate to see if their season will continue.